We love mushrooms. A year ago my wife bought me a present of a box of grow your own mushrooms. It was fun but didn't yield many. So this year I bought some mushroom spawn, (not seeds, but the way that mushrooms reproduce) from an outfit in Washington. We go through at least a pound a week in a variety of mushrooms, so anything we can do to reduce the money spent will be well worth the effort. Shiitake mushrooms are a healthy choice as well as many of the stir-fry dishes we make have them as the mushroom of choice. We like the meaty texture of these mushrooms as well. I'll post more picts as this project progresses. Today it will be inoculating the log with the spawn. Then I have 6 months to a year till I get a yield but the logs will yield for 1-2 years. The log in the forefront is plugged then sealed with wax. The one in the back is plugged waiting for the beeswax to seal it. The highlights of the article, besides how to grow, is the majority of garlic in the world is produced in China using methods we would rather like to avoid. 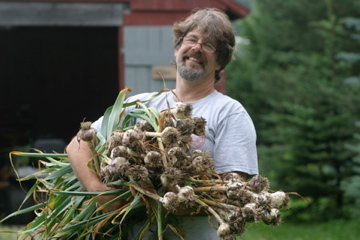 As we begin our spring planting and I watch the garlic cloves we planted last October begin to poke through the mulch we laid to protect it through the winter, I think why doesn't everyone grow their own. In the northeast it is really an easy and fun crop to grow. You plant the cloves in the fall spread a layer of mulch to protect it in the winter and about mid July you pull it out of the ground. It is one of our favorite tasks to pick on the farm. 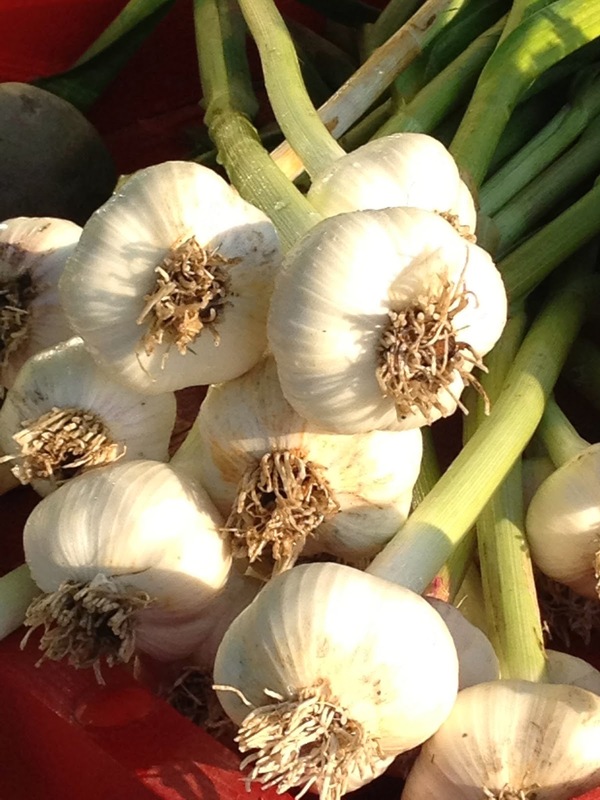 There is nothing like pulling out beautiful heads of garlic all started by a single clove. We grow more than enough to stock us for the year ( we go through about 3 heads a week) and to sell by the road. We grow about eight different varieties, softneck and hardneck. After reading the above article I am more glad than ever that we grow our own. It really does matter where your food comes from. It is even better when you grow it yourself. With a lull on the farm, a great winter and 3 maple trees on our front lawn "sugarin" was calling to me. I have always wanted to try my hand at it and the local Agway was selling the equipment so we tried it out. I had been collecting sap for the past week. I had about 7 gallons from the 3 trees and 5 taps. I didn't know what to expect. We collected a little bit each day over the course of a glorious warm spring like week the first part of March. We then had a blizzard come through which gave me a day off from other responsibilities. So what better time to reduce the sap. It takes about 36-40 gallons of sap to get one gallon. Basically you boil off that much water to reduce it to syrup consistency. We had a clambake setup my brother had given us along with a full tank of propane so I filled the pot about 7 gallons worth of the 10 gallon pot and got it to a boil. This was about 9:00 in the morning. I figured I would be lucky to gat about a pound and half of syrup out of the sap. It took till about 4:00 in the afternoon to finish the boil and then we filtered it through some cheesecloth. The resulting taste was delicious for our first attempt. Maybe we'll gather some more sap over the next week and try it again. This weekend a friend on Facebook posted a link to an article. This lead me on a hunt for similar articles on the topic. Food Soil and our Nutrition I found three articles that all spoke to how our food even organically grown is missing nutritional benefits compared to food from 70 years ago. This is due to our soil being depleted by traditional agricultural methods. In one article, selenium which is known to help battle the growth of cancerous cells in our bodies is becoming absent from our food. Artificial fertilizers, petrochemicals used in agriculture may provide NPK(nitrogen, phosphorus, and potassium) but though that is what is needed to grow healthy plants, it is not the sum of the whole. There are 27 trace elements that plants also absorb which then can make its way into our bodies to help our immune systems. But these have been depleted from our soil. We haven't been feeding our soils. Steve Solomon founder of Territorial Seeds back in the 70's has spent his life working the land and understanding what the soil gives to us. His book "Gardening When it Counts" speaks to the power of the soil. 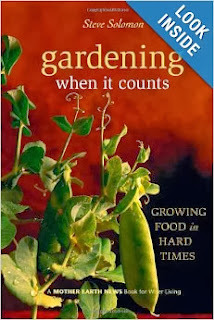 Initially when I read it I thought this guy knows his stuff, but it was just some guy's take on how we should garden. After reading these articles his book has caused me to take his recommendations more seriously. These articles speak to the rise of diseases and illnesses in humans since the advent of modern agricultural methods. How certain trace elements are all but gone in the soils. One such element is calcium. If you have deficiencies as everyone knows leads to bone loss and osteoporosis, but it also leads to depression, problems with blood clotting and heart palpitations.Vegetarians used to be able to get all their nutrition from the food they ate but now they can't because those vital nutrients are missing from the soil. You can also look and say that it is also missing from our meats too as our animals are eating processed food that is also missing those trace elements. Read the following articles and you will understand how we growis just as important as what we grow. Paleo, Vegan, Pescatarian, Anti-inflammatory, Where to go? The Grain Brain is a book on the top of the book charts lately. It supports the latest fad of diets pertaining to the paleo diet. The diet is geared towards what the paleolithic humans of the world ate. No grains, no starches primarily. In our kitchen we are constantly trying to balance what we eat with the latest information for health out in the data world. What to eat what not to eat could drive you absolutely up a wall. For every positive report their is a report to refute it. We have tried to strike a balance based on repeated research verified from different sources. If different sources are saying similar things based on different research it is probably a good bet that there is some truth in the assertions. Our take on things? Eat mostly plant based diet, eat healthy nuts stay away from processed food and red meats. We basically stay away from all meats except for fish. If you would ask we have a rationale for it all. One book that was fascinating in its laymen's description of how cancer and inflammation works in our bodies is "Anti-Cancer A Way of Life" It explains how sugars feed the cancer and our cells. In a class I taught called "You Are What You Eat" We looked at food pyramids that are on the net. Asian, Mediterranean, Vegetarian, South American. We looked for what they all had in common to make personal choices for our eating. Most had grains, fruits vegetables and nuts at the bottom of the pyramids. Red meats were at the top of all of them in small portions as was added sugar. A recent article in Business Insider speaks to all the diet fads and the research out there. "What Gluten Really Does to Your Brain" mentions that "When a person advocates radical change on the order of eliminating one of the three macronutrient groups from our diets, the burden of proof on them should be enormous. Everything you know is not wrong." Use common sense and verified advice that gives you not what you want to hear but what truly makes sense. We avoid red meat not because we don't love it. It is totally because of my heart health concerns and more reports have proven that red meat is a concern for heart patients than evidence to the contrary. So we have eliminated that from our diets. Most medical research has shown walnuts and almonds have good benefits to heart health. My cholesterol and bloodwork numbers support those claims. We try to eat mostly seasonal foods. We do have our top 3 or 4 vegetables which are pretty much staples in our diet. Kale, sweet potatoes and brussel sprouts. Garlic, pepper, turmeric and onions are other staples in our pantry and in most of the dishes we prepare. All have been proven to be good for the heart and our diet. So the bottom line for us is most things in moderation, grow what we can and eat that. Eat seasonally and minimize or eliminate processed food where ever possible. This summer was a summer to learn this. I worked night and day to finish the gypsy wagon and I was exhausted. When I finished I realized what I had placed aside. The house wasn't finished with the last sides unpainted. The garden was overrun with weeds, the whole farm suffered from weeds. My aches and pains which I attributed to working so hard on the wagon persisted, so I took a few days of rest. The aches and pains didn't improve with rest. I could barely walk without pain. I took to walking with a hiking pole. I finally went to my doctor and asked what was going on and he narrowed it down to the statin I was taking. It would take a month to a year to get my strength back and it made me come in touch with my mortality. I am not getting younger. Do I work to make a buck or work to have income and work to enjoy this piece of paradise we call Purple Dog? Shari has told me for awhile, we have to focus on what we do well and what we enjoy. The goal of this farm has always been a lifestyle choice. We knew we would never replace my income with proceeds from the farm. We came to this farm to grow food. Our food. What ever food was more than we needed we would share with others. Sell the extra by the road, give the garden overflow to friends. It is all a matter of balance. Do what we enjoy, share it with those who are close to us and savor the moment. The things I enjoy most are my family and friends and cooking for them. Dinners with witty conversation, politics, religion, laughing and stories these bring richness to my days. As fall draws to a close we will look to these things as we plan our next growing season. "Enjoy the farm", is as much a statement for our friends as it is for me. Recently we went out to dinner with some friends. As so often happens when dining out the conversation centers around food. Our friends made a statement oh you're vegetarians so you must eat a lot of salads. Salads? Actually to the contrary, we eat salads when the garden is producing our lettuce but the rest of the time no not often. We have found so many recipes that are nourishing and filling that we just don't think about salads. 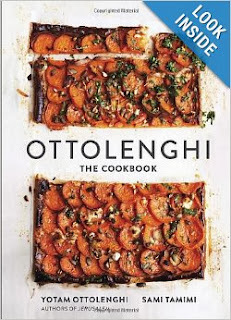 Recently one of our favorite cookbooks is Ottolenghi. This cookbook based on the recipes of a restaurant of the same name is just an amazing flavorful book. The recipes are centered around middle eastern cooking specifically Palestinian and Israeli. The flavors are exotic and unique and Yotam Ottolenghi teaches you techniques and blending of spices you would never think go together. We have three of his cookbooks and we are always surprising ourselves and out dinner guests with flavors that are just decadent. Check out his site to get a peak of some of his creations and some recipes. Ottolenghi. For inspiration we have looked to other cultures that are more plant based in their diets. Many Asian inspired cuisines have little or no dairy and most are heart healthy. So salads are just not on the menu often at our house but when they are you know it will be filled with the fruits of our garden. Most vegetarian recipe books are loaded with cheese. It seems many makeup for lack of meat and protein by adding cheese. Before my heart issues I loved cheese, still do. That has been the more difficult thing to get out of my diet, cheese. Sure I miss the nice grilled steak on the 4th of July but think about cheese and what you may have it in. On a sandwich, on your pasta, in an omelet or your favorite pizza. This is one of the areas I have found some replacements come in handy. In most cases I don' t want to mimic something I love. I will reduce the quantities or find an alternative. Rice shreds, this company makes a cheddar and a mozzarella that okay doesn't melt like the real deal but we use it in omelets and you would be hard pressed to tell the difference. It gives me what I am looking for a great omelet with none of the fat from cheese. We make our own pesto with our own basil, and garlic from the garden. We found a pesto recipe in a vegan cookbook. Vegan With a Vengeance ,instead of cheese she uses nutritional yeast. Pesto is high in fat between the cheese and oil so reducing any portion is helpful. We cheat a bit and sprinkle a good quality pecorino romano or parmesan over the top of the dish. The nice thing about hard cheeses they are lower in fat(but higher in sodium) than other cheeses. This recipe also uses walnuts vs pine nuts which are heart healthy as well. The other cheese we use is fat free feta. I have grown to appreciate this cheese. Sprinkle it on salads put it in a wrap this cheese adds flavor and protein. My take on my diet is, if I have to exclude things from my eating then you bet I am going to make it as flavorful and enticing as I can. This diet has opened up my palate to many dishes and cuisines that I never would have tried before. I don't starve and I don't eat just salads. I devour freshly prepared, flavorful dishes which helps me to not miss the things that are not in my diet. A few years back I had some health issues. Heart related. Reading, research and a great doctor had me reassess my eating and health habits. This was not as straight forward as it sounds. I had no history of high cholesterol, no high blood pressure. None of the typical warning flags that go along with heart problems. Life stresses like everyone yes. At first I moderated what I ate excluded red meat and cut back on dairy. After a year I had another scare and when I came out of the hospital my wife and I took a look again at what I was doing right and wrong. Since the first incident we moved to a country farm house and began growing our own food to help defray the cost of the fresh produce that became more and more a centerpiece of our diet. I say "our" because to my wife's credit she changed her diet to reflect mine. She didn't have to, but being supportive and from both our research we found that it could only help her health too. So we began our journey down the road to vegetarianism. We both look back now and say it truly wasn't as hard as it seemed at first look. We are not vegan, we still eat eggs(we have our own flock) but we eat very little dairy and the only meat in our diet is fish typically once a week. In some ways we are more vegetarian than most vegetarians. Many recipes in most vegetarian cookbooks bury the dishes in cheese. We are virtually cheese free except some hard cheeses like pecorino romano and fat free feta. The hard cheeses we use a bit on our pasta dishes for flavor no more than a tablespoon. Fat free feta is used in some of our salads. Our Sunday mornings are omelet day and we typically have mushroom omelets with a fake cheese called "Rice Shreds". It melts just enough in an omelet to be convincing and to make us not feel too deprived. Actually that is the amazing thing we don't feel deprived. We have found so many new dishes that we felt like we eat like royalty. Our cooking skills and exposure to other cuisines has increased dramatically. Our independence from fast food, and prepared foods has been a benefit to our health and our wallets. My purpose in writing here is to chart our progress from carnivores to herbivores, from medically damaged to healthy. From just consuming to self sustaining. As we slip into the short days of fall the harvesting of apples, the prepping of the beehives for winter, our minds look to what the farm will hold for us. When we look to what the farm means to us it is more the lifestyle. We strive to be self sufficient, we are at the whim of the weather and the changing seasons but we enjoy that challenge. We are not getting any younger and maintaining some of the things we have created takes its toll on living the lifestyle we strive to enjoy. We are looking at scaling back some of our day to day endeavors and refocusing on the things we enjoy and the things that brought us here in the first place. Honey and the bees have been a surprising joy. Both of us knowing little about what it means to keep bees we are looking at plans to make the farm an oasis for the bees to help provide for them and keep them healthy in a sea of pesticides and lack of environmental support. We began with sixty trees, some have died some where replanted we added some pear, peach and plum. We love sharing our harvest with friends and family and we look to keep our fall cidering event sharing our bounty. This year it got away from us the weeds were never ending and between working on the wagon our yield was not quite what it could have been. This is the main reason for the farm. We strive to grow what we need and share the extra by the road. It is here where we will refocus and look to develop our gardening skills to be more successful at growing the food we enjoy. Lavender is work. We love the scent , the beauty and the benefits to the bees. We feel that the bees are healthier because of this flower. A natural miticide we haven't had to medicate our hives this year for varroa mites. We hope this will continue. We will harvest lavender for our home, our friends and the wagon but it will be here mainly for the bees. Their lavender honey is second to none and we will maintain it for the bees. We moved here for my health - our health and we have seen the benefits in our medical checkups. Weight loss, lower cholesterol, lower stress. Increase vigor in our lives. By switching to a primarily plant based diet we have seen dramatic improvement in our way of life. You will see in our blog more of an emphasis on how we made our changes to this way of life and how it has affected us. We are not vegetarians or vegans in the strict sense of the definition. We eat much more than just salads and the food we create is rich with nutrients, full of flavor to the point we don't miss what is out of our diet. If we can share with you our journey maybe it can help someone else who is struggling to lose weight, or rebound from their diagnosis of heart disease or diabetes - and to live healthier richer lives. We stay pretty busy on the farm. Most weekends we are on the farm doing some chores, painting, fixing, feeding animals. If you cruise by the farm and see a car in the driveway and want to visit the farm store but the doors are closed, you will see a sign on the wagon saying ring the bell for help. We have a school bell on a post near the wagon. Just ring it and we will come running to open the store. It is that easy. We have the last of our lavender honey in the shop. Our orchard is looking great and we may have some apples for sale in October too. The wagon will be hit or miss during the week as one of us heads back to teach in September. We are usually home at night so if you are in need of anything stop by or message us on Facebook.